Win a crawfish boil for you and up to 50 of your friends from The Crawfish Shop in Lufkin. Click the entry points below to increase your chances at winning yourself a hefty crawfish boil. Gain EXTRA chances to win by entering at East Texas Pawn. Gain even MORE entries by listening live for DAILY (weekday) code words, and having our app on your smart device set to receive contest notifications. 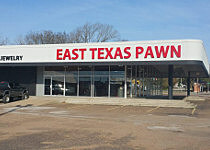 Come see the new location of East Texas Pawn. East Texas Pawn now has an even bigger selection of firearms with brands like Browning, Ruger, and Remington. Arm yourself with all the gear you need like binoculars, scopes, ammunition, knives, and more. Also check out the large selection and big discounts on jewelry, rings, watches, and wedding sets for that special someone in your life before you shop anywhere else. Go by East Texas Pawn now in their new location. We're at the old Loving Building on Timberland Drive in Lufkin. Disclaimer: Prize value minimum $700 - Amount of crawfish determined by current market price.